Arrest of Catholic Bishops Continues in China. 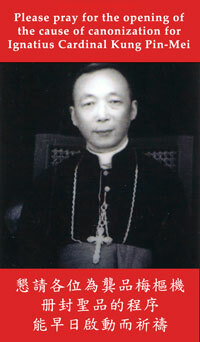 His Eminence Ignatius Cardinal Kung Pin Mei is now stateless. He lives in the United States. The Chinese Government has refused to extend Cardinal Kung's Passport and has confiscated his passport. When Joseph Kung, Cardinal's nephew, requested an official written notice for its decision, the Chinese Consulate staff in New York refused. In a recent interview with the Chinese Press in New York on February 12, 1998, Mr. Ye Xiaowen, the Director of the Religious Bureau of China, stated: "Kung Pin Mei committed a serious crime by dividing the country and causing harm to its people." 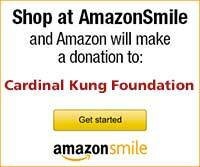 Joseph Kung, the President of the Cardinal Kung Foundation, commented: "Cardinal Kung is now almost 97 years old. The Chinese government incarcerated him for 32 1/2 years for his religious belief. It does not take any imagination to understand that a country which punishes an elderly Cardinal for his religious belief by suspending and confiscating his passport at such a golden age and almost eleven years after his incarceration is surely a country without any religious freedom. This is another piece of irrefutable evidence that there is no let up of religious persecution in China. What is the Chinese government afraid of in a 97 year old clergy?" Arrest of the Roman Catholic Bishops continues in China. Bishop Zhang Weizhu, an underground bishop in Xianxian, Hebei, was arrested a week ago on Pentecost Sunday May 31 on his way to his village. He was ordained a bishop in 1990 and founded two religious orders. No other details are available at this time.